From the South: Take Route One North to Bethany Beach to Route 26 where the Totem Pole is. Continue North on Route One for one block and turn right on Central. Captain Jacks will be on your left at the corner of Central and Pennsylvania. 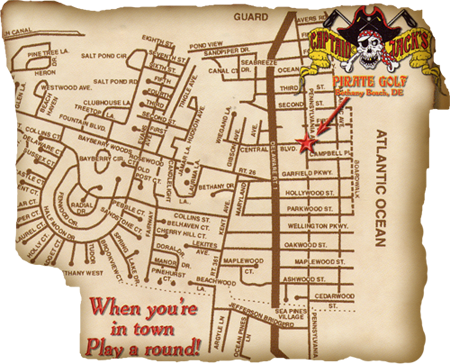 From the North: Take Route One South to Bethany Beach and turn left on Route 26 (where the Totem Pole is) and take your first left on Pennsylvania Ave. and Captain Jack’s will be on your left in one block at the corner of Central and Pennsylvania Ave.